CLEVELAND, Ga. – The White County Board of Commissioners unanimously approved the request by HG Acquisitions to redistrict 179 acres located at 1036 Duncan Bridge from A-1 Agriculture to R-1 Single-Family District for the purpose of the construction of a 100-home subdivision during Monday’s called meeting and work session. Following a second public hearing, the Board also approved the land use application filed by Gary Hosemann to redistrict 8.28 acres at 4623 Hwy. 254 and Mossy Creek Road from C-1 Community Commercial to A-1 Agriculture Forestry District for the purpose of building his personal residence on the property. Again, there were no speakers in favor of or in objection to the proposal. Kelli Withrow’s request to redistrict half acre at 2416 Westmoreland Rad from R-1 Residential Single Family to R-3 Residential District (Seasonal) was also approved unanimously. Commissioners approved addenda No. 3 for the fiscal year 2019 contract with Legacy Link for funding of services provided to the senior center. The Board also unanimously approved a request for SPLOST funding in the amount of $68,842.45 for a nine-month continuing agreement with ACS Landscape Management for installing and taking care of the ballfields at Yonah Preserve ballfields. Commissioners did not vote on the on a proposal for architectural services with BCA Studio for the courthouse entryway and sally port project, but directed County Manager Michael Melton to gather more information on the project. « Previous Article Absolute Dysfunction and Eggs! 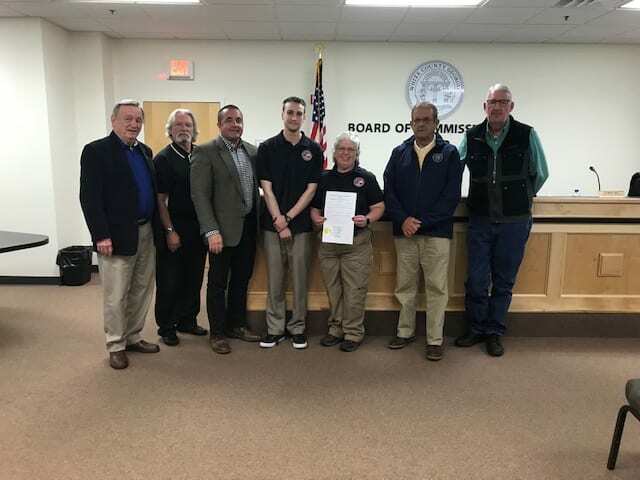 CLEVELAND, Ga. – White County Commissioners meeting in a combined work session and called meeting Monday presented a proclamation declaring 9-1-1 week in White County. The White County 9-1-1 Central Communications Division is an integral part of the White County Office of Public Safety. The division provided optimum communications for the White County Sheriff’s Office, Fire Service, Emergency Medical Services, Animal Control, Cleveland Police Department, Cleveland Fire Department, Helen Police Department and Helen Fire Department. The E 9-1-1 Communications Center is a 24/7 operation and is manned by four 12 hour shifts utilizing three to four communications officers per shift. The Center processes phone calls from three sources, 9-1-1 emergency lines, alarm lines and administrative lines. Emergency line are accessed by dialing 9-1-1 or by being transferred from another 9-1-1 center. Alarm lines are used only by alarm monitoring companies reporting various alarms. Administrative lines are uses for all other phone calls. Public Safety Director David Murphy told commissioners, “In 2018, the call volume increased by 29 percent to 136,940. Radio transmissions/incidents decreased by 12 percent to 164,378. The 9-1-1 center is led by Chief Leah Sullens. 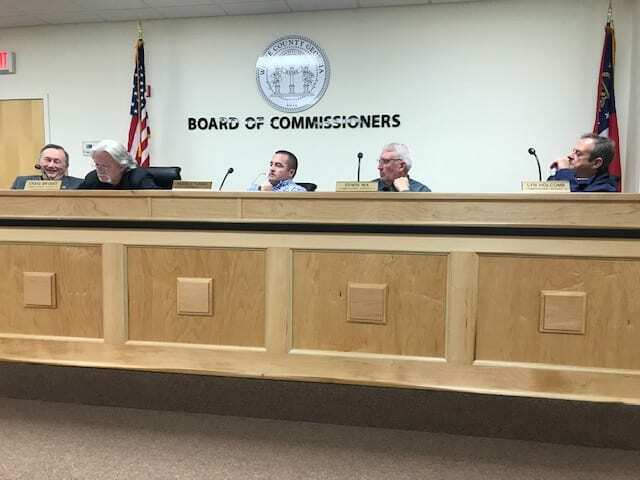 CLEVELAND, Ga. – Monday’s White County Board of Commissioners combined work session and regular meeting was a lengthy one, lasting more than three hours as commissioners dealt with three public hearings and again wrestled with the short-term rental issue. Commissioners held public hearings then approved three rezoning requests. Kelli Withrow asked for and received unanimous approval to rezone five acres located at 3216 Hwy. 75 South in Cleveland from Community Commercial District to Highway Business District (Seasonal) to permit the cottages at the Mossy Creek Wedding Venue to be converted to short-term rental units. Keith Edsall and Gina Santaniello asked to have 4.79 acres at 103 Blackwell Drive rezoned from single family district to residential district (Seasonal) to qualify for short-term rental. Commissioners also approved preliminary road acceptance for Samson Way and Charleston Lane in the Reserve at Mossy Creek. There is a two-year waiting period and the issue will have to come back before the Board to ensure the roads meet the standards for county acceptance. Continued their discussion about how to regulate short-term rentals in the county. 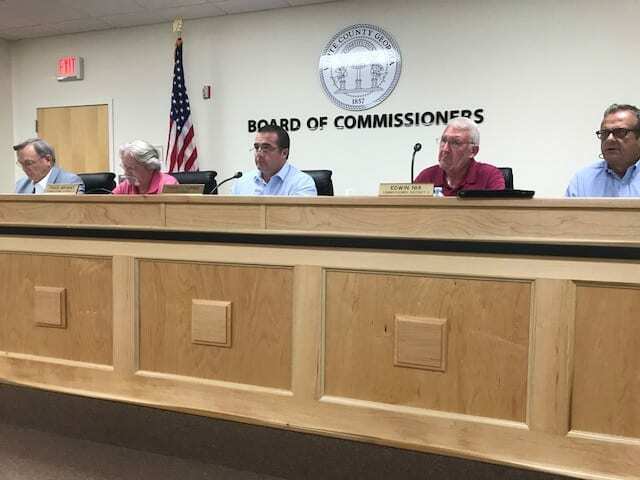 CLEVELAND, Ga. – White County Commissioners will conduct three land use application public hearings when they meet in a combined work session and regular meeting Monday at 4:30 p.m. The first public hearing on the agenda is for Kelli Withrow who has requested that five acres located at 3216 Hwy. 75 South be redistricted from Agriculture Forestry District (A1) to Residential District Seasonal (R3). The second is for Melo Hairapetian who has requested redistricting of 3.72 acres located at 102 Doc Dorsey Road from Community Commercial District (C1) to Highway Business District (C2). The third public hearing is for Keith Edsall and Gina Santaniello who have requested that 4.79 acres located at 103 Blackwell Drive be redistricted from Single-Family District (R1) to Residential District Seasonal (R3). 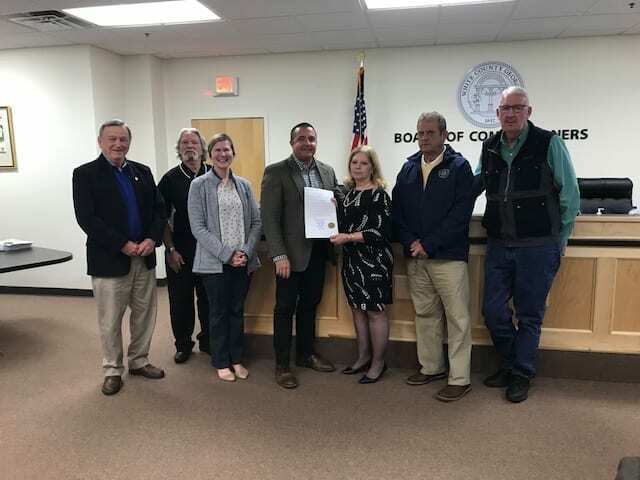 Commission Chairman Travis Turner will read a proclamation in recognition of 911 appreciation week in White County and another that proclaims that April is Child Abuse Prevention month. Revisions to the White County Land Use Ordinance related to required public hearings procedure and short term vacation rentals. BOC to vote on contract to resurface Westmoreland Rd. CLEVELAND, Ga. – The White County Board of Commissioners are expected to vote on awarding a contract for the resurfacing of Westmoreland Road to CW Matthews in the amount of $890,342.82 when it meets in regular session Monday (March 4) at 4:30 p.m.
Funding for the project is dedicated from the Local Maintenance Improvement Grant (LMIG) and Special Purpose Local Option Sales Tax (SPLOST). Commissioners will also consider awarding a contracts to Greenville Turf and Tractor in the amount of $12,973.74 for a bunker and infield rake; Kabe Cain Enterprises ($18,900) for a 4-wheel drive utility tractor; Nelson Tractor ($12,645) for a utility tractor and Howard Bros. ($12,784) for a commercial grade zero turn riding mower). Several revisions to the White County Code of Ordinances will be voted on under the consent agenda, including standard operating procedures, emergency management advisory council, payment for services rendered by reserves of the county fire department and volunteer firefighter standard attendance and participation. Items listed under the consent agenda do not require further discussion since they were considered during the last work session and may be approved as a group. The Board will also vote on adopting a surplus resolution for equipment assigned to the White County Public Safety and Public Works departments and a resolution of revision to the White County Alcohol Ordinance. Commissioners will also read a proclamation of recognition of the Public Safety – Animal Control divisions for their achievements. CLEVELAND, Ga. – The issue of short-term rentals will be back before the White County Board of Commissioners when it holds a voting session Monday (Feb. 25) at 4:30 p.m. followed immediately by a called meeting. Two weeks ago, commissioners directed staff to draft a stand-alone ordinance to regulate what has become a booming business nationwide. The issue is considerably more complex than what it seems on the surface. On the one hand, those who would like to rent rooms in their home on a short-term basis argue they have a right to use their property as they see fit. On the other, some neighbors counter that kind of activity can affect security in the neighborhood as well as property values. Commissioners had to decide whether to regulate short-term rentals under the county’s land use plan or to draft a stand-alone ordinance. They voted unanimously for the stand-alone ordinance. Approval of the March 4 regular meeting agenda.